WASHINGTON (AP) — Defense Secretary Jim Mattis on Wednesday defended the use of active duty troops on the U.S.-Mexican border, saying that in some ways it provides good training for war. He argued that it’s analogous to a 1916 deployment to counter the Mexican revolutionary Gen. Francisco “Pancho” Villa. In his most extensive remarks about the hastily arranged border mission, Mattis argued that it fits an historical pattern dating to early in the 20th century. He noted that President Woodrow Wilson deployed tens of thousands of National Guard and active duty troops to the border in 1916 in response to a Mexican military raid into the U.S.
“That’s over a century ago, and the threat then was Pancho Villa’s troops — revolutionary raiding across the border into the United States,” he said. He noted that more recently, National Guard troops were used in border missions ordered by President George W. Bush and President Barack Obama, although not on the cusp of a midterm election. The Pentagon chief said that within a week to 10 days the 5,800 troops currently deployed for the border mission will have accomplished all the tasks initially requested by Customs and Border Protection, although additional tasks are now being worked out between the Pentagon and the Department of Homeland Security. Mattis did not say how soon the mission might end; current deployments are scheduled to last until Dec. 15, but that could change. In addition to the 5,800 active duty troops in the border area, about 2,100 National Guard troops have been providing border support since April. 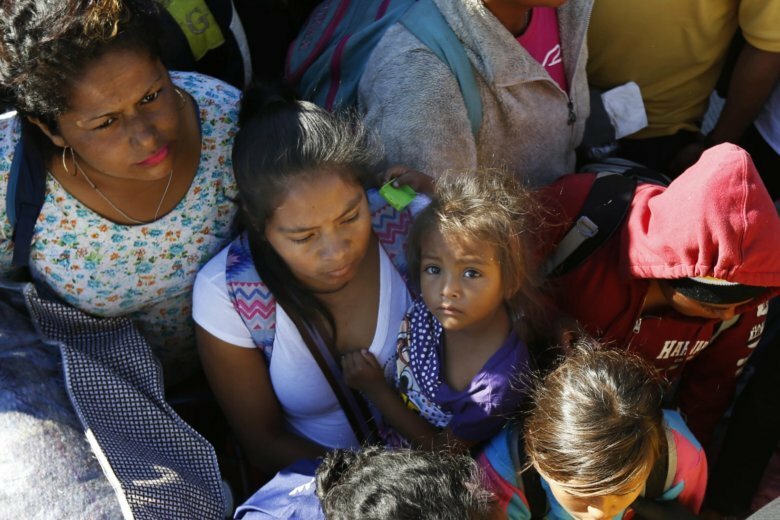 Critics have questioned the wisdom of using the military on the border where there is no discernible security threat, although President Donald Trump has said that a caravan of Central American migrants traveling northward through Mexico amounts to an “invasion.” Since the election, Trump has said little about the matter, and no border threat has yet materialized. Asked whether he believes there is a security threat at the border that justifies the use of the active duty military, Mattis said he defers to the judgment of Homeland Security Secretary Kirstjen Nielsen, who joined him at the border Wednesday. Nielsen and Mattis spoke with senior U.S. commanders and addressed rank-and-file troops. Mattis told the troops their mission is to “back up” Customs and Border Protection. “Right now that’s our role and that’s all our role is,” he said. “The eyes of the world right now — certainly all of the Americans — are on you,” Mattis told the soldiers, adding that they are part of a “non-traditional” mission. “We’re here because of the number of illegals who say they are going to illegally try to cross into our country,” he said, apparently referring to the several thousand migrants moving north through Mexico. One soldier asked Mattis what are the short- and long-term plans for the military mission. In an interview with reporters traveling with him to Texas, Mattis took issue with assertions by critics that the deployment undertaken shortly before the Nov. 6 midterm elections was costing the military in preparedness for combat. He said military officers have told him that the deployment has been “very good training” because it amounts to a rehearsal for the kind of logistical demands — such as loading aircraft — that must be met in wartime. “In terms of readiness, it’s actually, I believe, so far improving our readiness for deployments,” he said. Mattis said the mission, which does not include performing law enforcement tasks, was reviewed by Department of Justice lawyers and deemed a legal undertaking. “It’s obviously a moral and ethical mission to support our border patrolmen,” he said. AP Radio correspondent Sagar Meghani contributed to this report.